The size of your goldfish tank will depend on area availability and the number of fish that you intend to keep. 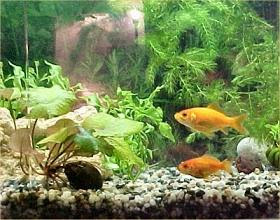 Goldfish is one of the aquarium fish species that requires large tank size for it to grow well and stays healthy. Main reason for needing large volume of water is because more water will mean heavy waste generated from your goldfish especially ammonia will be diluted to lower concentration and thus less likely to cause any harm. This will also help to prevent spread of aquarium fish disease especially dropsy and swim bladder or flipover condition. That means, if you have 4 goldfish with each measuring 3 inches in length, you would require at least 36 gallon fish tank size to accommodate all your pets. However, bear in mind that common goldfish can grow up to 8-10 inches in length and thus your aquarium should be sized accordingly to cater for your pet’s maximum growth. Common mistake made by aquarium owners is to buy smaller tanks when they think that this is more than enough for the younger fry but later found out that, the fish tank size is in fact not big enough after all. Having the right aquarium size is very important because without much room, this will mean that your goldfish will not be able to reach maximum growth size and will become stunted. This will also lead to development of not proportionately equal fin size.